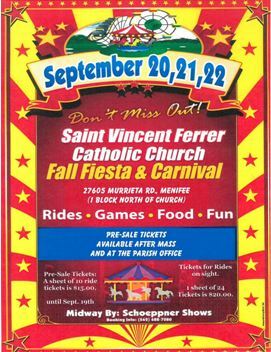 If you are looking for something fun to do with your family, the St. Vincent Ferrer Church’s Fall Fiesta & Carnival is starting on Sept 20th. With kid rides, adult rides, games, food and music by Country Western Group “BACK HOME” everyone is sure to have a good time during this three day local event. Tickets are now available for pre sale. 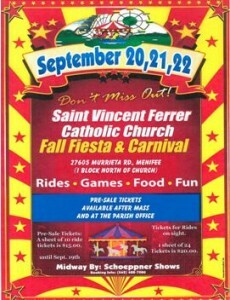 For more information call the Parish office at 951-679-4531.